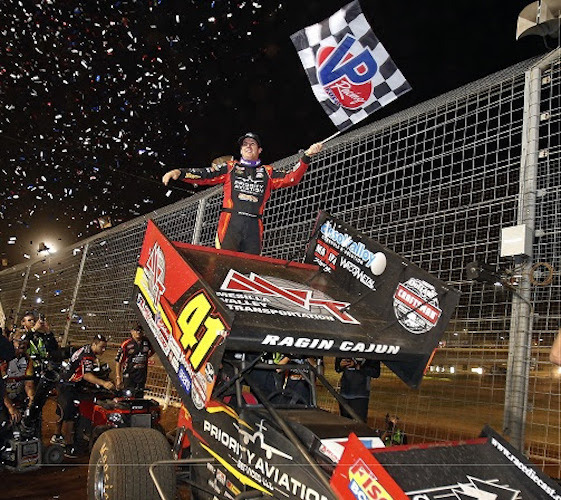 A frenetic Friday of Bad Boy Off-Road World of Outlaws World Finals racing saw three drivers from different sections of the United States celebrate at The Dirt Track at Charlotte Motor Speedway. Louisiana native Jason Johnson stormed to his fourth World of Outlaws Craftsman Sprint Car win of the season while West Virginia’s Josh Richards rallied for his record 18th World of Outlaws Craftsman Late Model victory. And New York State’s “Super” Matt Sheppard cruised to his 11th Super DIRTcar Big-Block Modified win of 2016. Johnson, “The Ragin’ Cajun,” dove under Dale Blaney in Turn 2 with six laps to go and held off Logan Schuchart, series champion Donny Schatz and Blaney for one of the biggest wins of his career. Johnson, Brad Sweet, Shane Stewart, David Gravel, Blaney and Chad Kemenah won heat races. Sweet and Blaney captured Dash victories. Richards _ aka “Kid Rocket” _ passed Chris Madden with four laps to go to set a new Outlaw Late Model single-season win mark. Running third with 15 laps to go, Richards cleared Darrell Lanigan for second and took advantage of a restart with 11 laps remaining to catch Madden. Richards rode the high line around the oval, zoomed past Madden and rolled into Victory Lane. Richards won his heat race, as did third-place finisher Lanigan. Tim McCreadie, Madden, Shane Clanton and Dale McDowell also claimed heat victories. Eric Wells, Brandon Overton _ who finished fourth in the feature _ and Steve Francis won last-chance qualifiers. New Yorker Sheppard cruised to his 11th Super DIRTcar Big-Block Modified win of the season in a stellar performance that saw the 2016 champion overcome a slew of late cautions for his 46th career win. J.R. McGinley and Chris Hale captured B-Main wins. Saturday’s season-ending World of Outlaws World Finals will get underway at 4:45 p.m. (EDT). Spectator gates will open at 3 p.m.
Next year’s WoO World Finals will start on Thursday, Nov. 2, and run through Saturday, Nov. 4. The OneDirt World Short Track Championship, also at The Dirt Track at Charlotte, will kick off the two-week dirt spectacular from Thursday, Oct. 26, 2017, to Saturday, Oct. 28. Heat Race 1 (8 laps): 1. Brad Sweet; 2. Greg Hodnett; 3. Donny Schatz; 4. Ian Madsen; 5. Kraig Kinser; 6. Kerry Madsen; 7. Greg Wilson; 8. Dane Lorenc; 9. Clyde Knipp. Heat Race 2 (8 laps): 1. Shane Stewart; 2. Logan Schuchart; 3. Brent Marks; 4. Tanner Thorson; 5. Paige Polyak; 6. Bill Balog; 7. Doug Esh; 8. Tyler Courtney. Heat Race 3 (8 laps): 1. David Gravel; 2. Daryn Pittman; 3. Lucas Wolfe; 4. Jason Sides; 5. Brock Zearfoss. Heat Race 4 (8 laps): 1. Dale Blaney; 2. Joey Saldana; 3. Danny Dietrich; 4. Tim Shaffer; 5. Parker Price-Miller; 6. Ryan Smith; 7. Cole Duncan; 8. Chad Boespflug. Heat Race 5 (8 laps) 1. Chad Kemenah; 2. Brian Brown; 3. Stevie Smith; 4. Paul McMahan; 5. Brady Bacon; 6. Hunter Schuerenburg; 7. Lance Moss; 8. Cale Conley. Heat Race 6 (8 laps) 1. Jason Johnson; 2. Danny Lasoski; 3. Sammy Swindell; 4. Dave Blaney; 5. Trey Starks; 6. Sheldon Haudenschild; 7. Jac Haudenschild; 8. Jay Galloway. C-Main (10 laps): 1. Tanner Thorson; 2. Trey Starks; 3. Carson Macedo; 4. Ryan Smith; 5. Hunter Schuerenburg; 6. Bill Balog; 7. Parker Price-Miller; 8. Tyler Courtney; 9. Tyler Bear; 10. Cale Conley 11. Kerry Madsen; 12. Jay Galloway; 13. Lance Moss; 14. Chad Boespflug; 15. Dane Lorenc; 16. Danny Smith; 17. Clyde Knipp. B-Main (13 laps): 1. Ian Madsen; 2. Paige Polyak; 3. Dave Blaney; 4. Tim Schaffer; 5. Jason Sides; 6. Paul McMahan; 7. Brady Bacon; 8. Sheldon Haudenschild; 9. Greg Wilson; 10. Doug Esh; 11. Cole Duncan; 12. Trey Starks; 13. Brock Zearfoss; 14. Jac Haudenschild; 15. Tanner Thorson; 16. Kraig Kinser. Dash 1 (6 laps): 1. Brad Sweet; 2. Greg Hodnett; 3. Shane Stewart; 4. Logan Shuchart; 5. David Gravel; 6. Daryn Pittman. Dash 2 (6 laps): 1. Dale Blaney; 2. Jason Johnson; 3. Chad Kemenah; 4. Brian Brown; 5. Joey Saldana; 6. Danny Lasoski. A-Main (30 laps): 1. Jason Johnson; 2. Logan Schuchart; 3. Donny Schatz; 4. Dale Blaney; 5. Brad Sweet; 6. David Gravel; 7. Shane Stewart; 8. Chad Kemenah; 9. Daryn Pittman; 10. Joey Saldana; 11. Brian Brown; 12. Brent Marks; 13. Lucas Wolfe; 14. Jason Side; 15. Danny Lasoski; 16. Dave Blaney; 17. Ian Madsen; 18. Danny Dietrich; 19. Sammy Swindell; 20. Greg Wilson; 21. Tim Shaffer; 22. Paul McMahan; 23. Greg Hodnett; 24. Paige Polyak; 25. Stevie Smith. Heat Race 2 (10 laps): 1. Chris Madden; 2. Austin Smith; 3. Frank Heckenast Jr.; 4. G.R. Smith; 5. Russell Erwin; 6. Hudson O’Neal. ; 7. Donald Bradsher; 8. Joey Coulter; 9. Brian Shirley; 10. Ross Robinson; 11. Bob Gordon; 12. Andy Fries. Heat Race 3 (10 laps): 1. Shane Clanton; 2. Billy Moyer Jr.; 3. Steve Casebolt; 4. Brandon Overton; 5. Max Blair; 6. Timothy Culp; 7. Kyle Bronson; 8. Donny Schatz; 9. Doug Sanders; 10. Justin Williams; 11. Tyler Erb. Heat Race 4 (10 laps): 1. Josh Richards; 2. Rick Eckert; 3. Tyler Carpenter; 4. Nick Hoffman; 5. Don O’Neal; 6. Jason Feger; 7. Johnny Pursley; 8. Dan Stone; 9. Michael Rouse; 10. Brian Ledbetter; 11.Dean Bowen; 12. Willie Milliken. Heat Race 5 (10 laps): 1. Dale McDowell; 2. Chase Junghans; 3. Jason Covert; 4. Mason Ziegler; 5. Steve Francis; 6. Chub Frank; 7. Jonathan Davenport; 8. Tyler Horst; 9. Pancho Lawler; 10. Allen Murray; 11. Blake Spencer. Heat Race 6 (10 laps): 1. Darrell Lanigan; 2. Jesse Stovall; 3. Morgan Bagley; 4. Ross Bailes; 5. Chad Hollenbeck; 6. Jordan Yaggy; 7. Kenny Moreland; 8. Riley Hickman; 9. Robbie Scott; 10. Boom Briggs; 11. Jeff Robertson. B-Main 1 (10 Laps): 1. Eric Wells; 2. Dale Hollidge; 3. G.R. Smith; 4. Ross Robinson; 5. Hudson O’Neal; 6. Brian Ruhlman; 7. Russell Erwin; 8. Nick Davis; 9. Donald Bradsher; 10. Ryan King; 11. Dustin Mitchell; 12. Bob Gordon; 13. Daulton Wilson; 14. Steven Roberts; 15. Brian Shirley; 16. Andy Fires; 17. Joey Coulter. DNS: Jeremy Miller. B-Main 2 (10 Laps): 1. Brandon Overton; 2. Nick Hoffman; 3. Don O’Neal; 4. Max Blair; 5. Timothy Culp; 6. Kyle Bronson; 7. Jason Feger; 8. Donny Schatz; 9. Dan Stone; 10. Michael Rouse; 11. Tyler Erb; 12. Doug Sanders; 13. Johnny Pursley; 14. Dean Bowen; 15. Justin Williams; 16. Brian Ledbetter. B-Main 3 (10 Laps): 1. Steve Francis; 2. Ross Bailes; 3. Mason Zeigler; 4. Jonathan Davenport; 5. Chad Hollenbeck; 6. Chub Frank; 7. Jordan Yaggy; 8. Riley Hickman; 9. Allen Murray; 10. Tyler Horst; 11. Kenny Moreland; 12. Pancho Lawler; 13. Robbie Scott; 14. Boom Briggs; 15. Blake Spencer; 16. Jeff Robertson. A-Main (50 laps): 1. Josh Richards; 2. Chris Madden; 3. Darrell Lanigan; 4. Brandon Overton; 5. Shane Clanton; 6. Dennis Erb Jr.; 7. Tim McCreadie; 8. Dale McDowell; 9. Chase Junghans; 10. Eric Wells; 11. Steve Francis; 12. Chris Ferguson; 13. Nick Hoffman; 14. Steve Casebolt; 15. Donny Schatz; 16. Dale Hollidge; 17. Rick Eckert; 18. Jesse Stovall; 19. Billy Moyer Jr.; 20. Jason Covert; 21. Ross Bailes; 22. Chub Frank; 23. Austin Smith; 24. Joey Coulter; 25. Frank Heckenast Jr.; 26. Tyler Erb; 27. Morgan Bagley; 28. Brian Shirley; 29. Tyler Carpenter; 30. Boom Briggs. B-Main 1 (10 laps): 1. J.R. McGinley; 2. Gary Tomkins; 3. Rich Scagliotta; 4. Mike Maresca; 5. Jean-Francois Corriveau; 6. Rick Regalski Jr.; 7. Carey Terrence; 8. Jeremiah Shingledecker; 9. Gary Edwards Jr.; 10. Ralph McBride; 11. Tim Fuller; 12. Frank Cozze; 13. Rob Bellinger. B-Main 2 (10 laps): 1. Chris Hale; 2. Max McLaughlin; 3. Brett Kresley; 4. Tim Kerr; 5. Billy Pauch Jr.; 6. Justin Wright; 7. Dave Rauscher; 8. Kenny Tremont Jr.; 9. Rick Laubach; 10. Matt Janiak; 11. Joe August Jr.; 12. Chris Raabe; 13. Marcus Dinkins. A-Main (40 laps):1. Matt Sheppard; 2. Justin Haers; 3. Billy Decker; 4. Pat Ward; 5. Danny Johnson; 6. Larry Wright; 7. Jimmy Phelps; 8. Gary Tomkins; 9. Stewart Friesen; 10. Brett Hearn; 11. Mat Williamson; 12. Tim Fuller; 13. Tyler Dippel; 14. Peter Britten; 15. Chris Raabe; 16. Jimmy Horton IV; 17. Keith Flach; 18. Brett Kresley; 19. Chris Hale; 20. Frank Cozze; 21. J.R. McGinley; 22. Ryan Godown; 23. Mike Mahaney; 24. Erick Rudolph; 25. Max McLaughlin; 26. Dave Blaney; 27. Ryan Watt; 28. Rich Scagliotta.